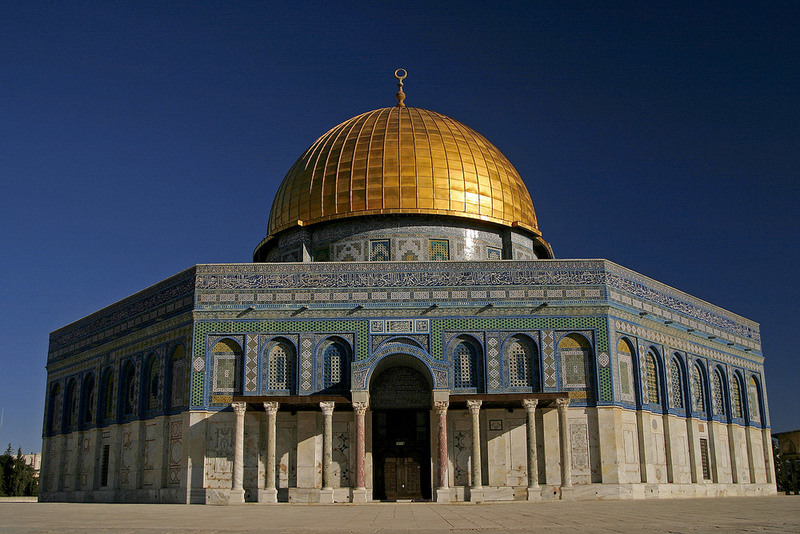 The Temple Mount is considered a holy site to three religions – to Jews, Christians, and Muslims. Jews and Christians recognize it as the site of the two previous biblical temples and it is considered the holiest site in the Jewish religion. To the Muslim the site is considered Islam’s third holiest spot as they believe the Prophet Muhammad ascended on a visit to heaven from this point. The Al-Aqsa Mosque stands there today. During the Six-Day War in 1967, Israel captured east Jerusalem from Jordan, and the Jewish people have been allowed to visit their holy site with one exception—they are NOT allowed to pray there. Under an agreement, the Muslim authorities manage the site’s religious and civilian affairs under Jordanian supervision. However, Israeli police oversee security. When I visited the Temple Mount in July, our tour group sat on the steps at the top of the Mount near the mosque. We faced one of the entrances to the platform and witnessed a Jewish man coming up the steps. As soon as he approached the mount, approximately twenty female Muslims surrounded him, heckling him the entire time he was there, which was about 20 minutes. They were loud and obnoxious. This is a normal occurrence. Recently there have been bursts of unrest at the Temple Mount - Palestinian demonstrations with bombs and tear gas. Because of the unrest, Israeli police have enlisted several hundred border patrol police reservists to patrol the Mount. Palestinians say that in the past two months there has been a new development where Israel has occasionally restricted some Muslims from the compound when Jewish people are visiting. Israel explained that this is to reduce friction. However, the Palestinians claim that Israel has an agenda to set Muslim-free Jewish visiting hours. It’s not a bad idea. During Ramadan, there were times when the Jews were not allowed to come to the compound. It seems only fair that Jewish people would be allowed to visit their most holy site without heckling and fear of attack. Israel, however, stated that they have no plans to change the rules. But even rumors are enough to spark controversy, reaction, and violence. In other areas of Israel, rockets have been fired from Gaza, exploding in the border town of Sderot this past Friday. Sderot has been hit hard by rockets from their Gaza neighbors, which is ruled by the terrorist group, Hamas. I visited The Eden Center, School for Girls, in July to see where our new bomb shelter would be placed. Gaza is only 2 miles from the school and, therefore, when sirens are heard, the girls have only seven seconds to run for shelter. Their new dorm will be completed soon with many new girls entering the facility for abused young women. Shmuel stands on the right and is the Director of Operation Lifeshield, the organization with which we work to provide live-saving bomb shelters in Israel! Lifeshield, the organization with which we work to provide life-saving bomb shelters. We continue raising money to put more bomb shelters in Israel near the Gaza border. To make a donation to our Bomb Shelter Campaign and help save lives in Israel, please click here.